The development of our society relies completely on the development of our children. By developing children, we do not only invest in their future and that of their families, but also in the future of our nation. Child development however, depends entirely on the quality of care and attention we as a society pay to their well-being and education. 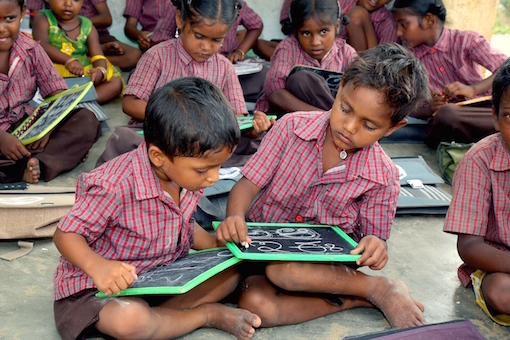 Many children in poor communities in rural Andhra Pradesh are missing the opportunities to dream of a bright future. With the prevailing poverty, illiteracy and lack of infrastructure, children in rural areas are being let down in terms of care and education. Lack of sufficient and regular income forces parents to send their children to work in slate quarries, handloom and lime industry. While being exposed to harsh and dangerous conditions and malnutrition, children become physically weak and suffer from health problems. ASSIST works hard to end this chain of suffering that has gone on for generations by strengthening child support systems in a comprehensive manner. Sustainable child development is only possible when we help entire communities to develop. It is crucial to create awareness on the importance of education and the consequences of child labour, to provide school infrastructure facilities and to help families to create sustainable livelihood alternatives in order to prevent them from sending their children to work. In this process, People’s Organisations are our most powerful tool. Village Development Societies, Self-Help Groups, and Mutually Aided Cooperative Thrift and Credit Societies make serious efforts to ensure that all children receive quality education and keep attending school.